If you just discovered that your old personal computer does not want anything to do with your new flash drive that you bought after seeing your friends pass their files around with it, be willing to shell out a little more cash for this cheap and functional VIA VT6212L 4+1-port PCI USB card for just one time. You'll have hi-speed USB 2.0 in no time. You might also want this if your current motherboard does not have hi-speed USB support. You'll know it if it takes a very long time to transfer very large files accross your external drive or if it takes a good hour to burn a full DVD video to an external DVD writer. 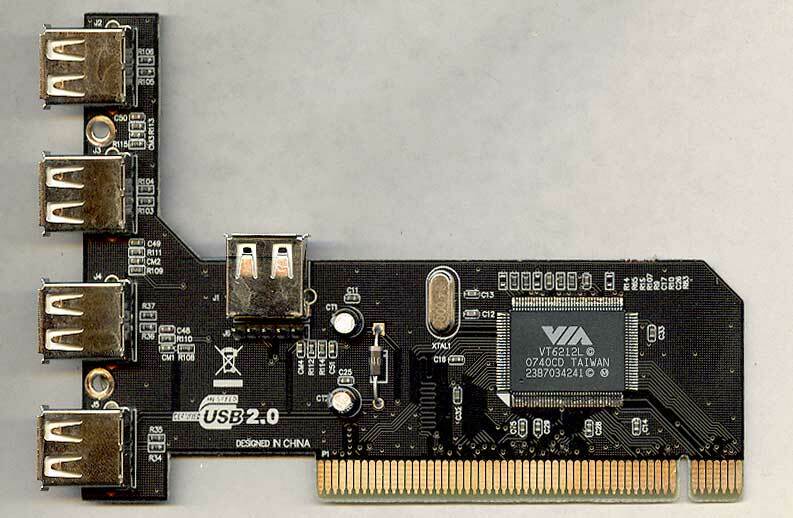 The VIA VT6212L is a USB 2.0 host controller chipset. It is the heart of most generic or rebranded USB PCI cards like the one I bought for Php220 ($5) at CD-R King. It is also used in consumer appliances with USB ports such as DVD players. Launched in 2003, it is since then used by some motherboards with onboard USB ports. VIA recommends it for mobile devices with its power consumption efficiency. 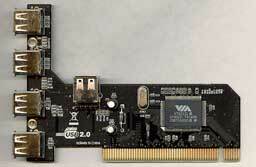 The VIA VT6212L is at the heart of this rebranded CD-R King PCI USB Card. The front panel metal cover has been removed for clarity. The internal USB port may be a future proof feature where you can insert a high capacity flash drive or a solid state hard drive inside your computer as a permanent internal drive. At present, along with the corresponding header pins, it is commonly reserved for an internal card reader's USB input/output connection. Other brands may exclude this extra port. Package includes a 3-inch driver CD which you will only need for Windows 98 or Windows ME. In Windows XP Device Manager, the plug-n-play device appears as VIA USB Enhanced Controller under Universal Serial Bus Controllers. The driver installs automatically once the card is plugged in to the motherboard. You might have difficulty inserting the card into the PCI slot due to its narrow gap at the contact edge. I used a cutter to widen this a bit and it fit snugly. 12.05.2008. Some motherboards made before USB technology came are found to be incompatible with USB cards like this. When installed, the computer fails to start. It is recommended only for USB-enabled motherboards.